No matter how many times I go to Gatorland , near Orlando, FL, I am always delighted by the chance to observe closely the waterfowl there as they mate, build nests, lay eggs and hatch fledglings. The boardwalk meanders across a lagoon with over 125 gators in close proximity. These prehistoric looking reptiles protect by their mere presence hundreds of bird nests. The raccoons, 'possums and even snakes are not likely to risk being in the neighborhood so the area has become very safe for nesting. 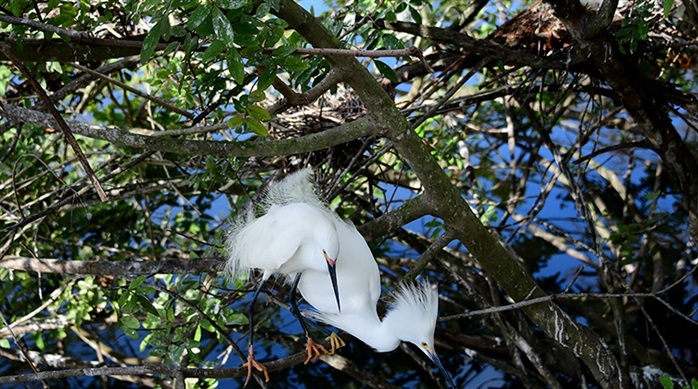 The Great White Egrets, because of their size, are very showy when they are in nesting mode. During this stage they have aigrettes, the long plumes growing from their back. 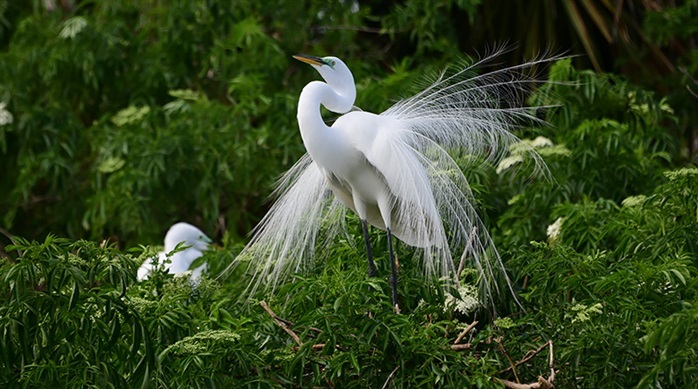 Because in the late nineteenth century these plumes were prized for women's hats, the Great Egrets were hunted to the point they became endangered. The National Audubon Society was founded in part to protect these birds. 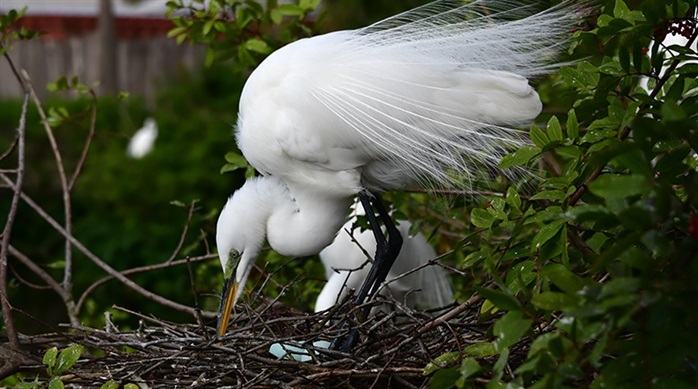 After eggs are laid the Great Egret has to routinely turn them in the nest so that they are kept warm evenly. Note green coloration on the egret's face from the eye to the beginning of the bill. This appears only during the breeding season. Snowy Egrets are smaller than Great Egrets. Their feet are yellow instead of black like their larger cousin while their beaks are black and the Great Egret has a yellow beak. Their breeding color at the base of their bill is red. 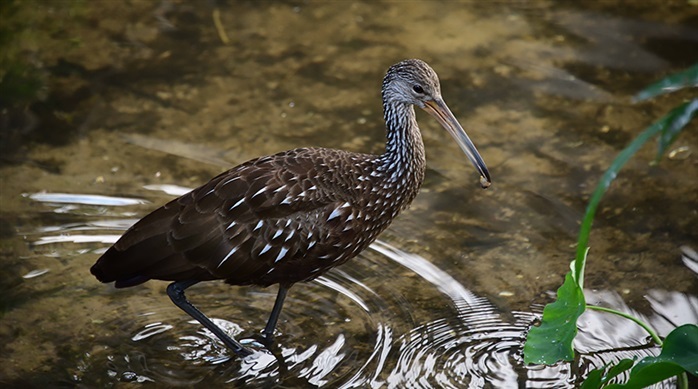 This unusual wading bird, the Limpkin, is found from Florida down to Argentina. It is usually in marshes and swamps searching for apple snails. 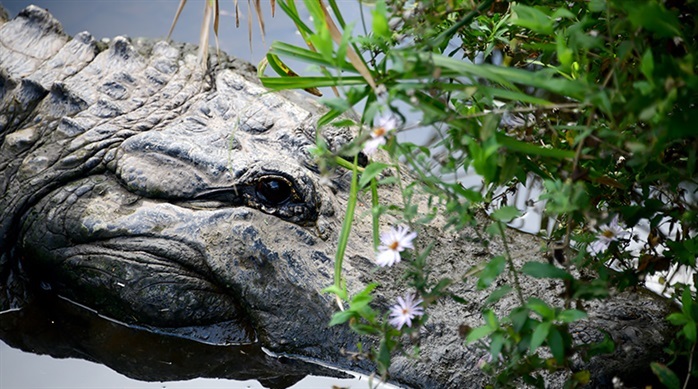 Rich in wildlife year round, Gatorland never disappoints. 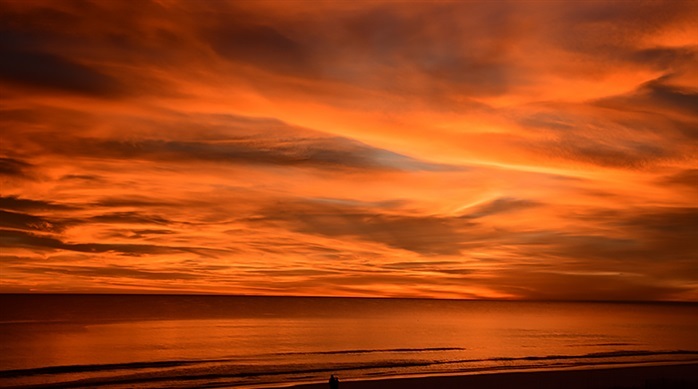 Santa Rosa Beach, Florida has been a family haven for three decades. There's not a bad month to be there. Each visit seems to bring special memories. 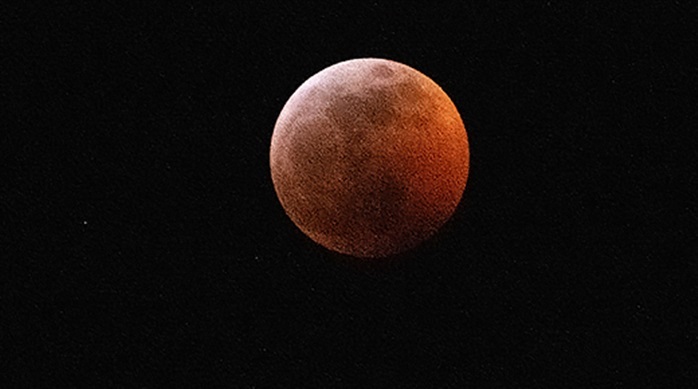 The rare blood moon was a beautiful sight in January. 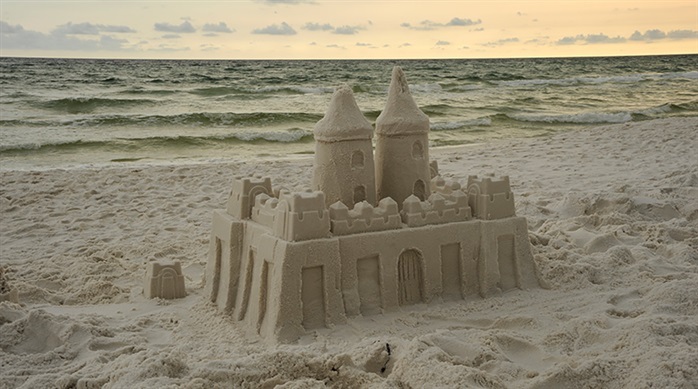 Despite the profusion of electronics on the beach, some still find time to build the traditional sand castle. 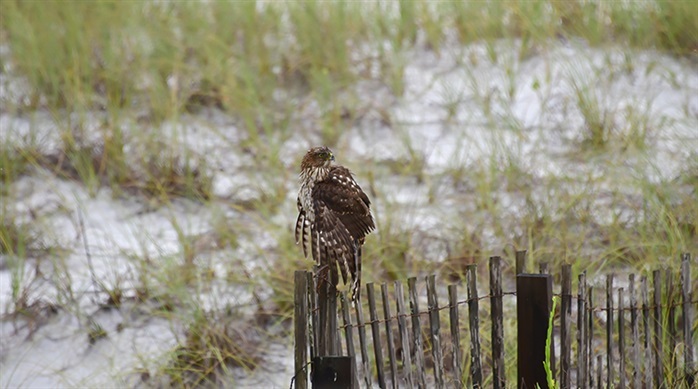 Although typically the bird life consists of waders and waterfowl, this juvenile Cooper's Hawk landed on a windy, rainy day to check out the area. And there simply is no better place to record awesome sunsets. Signs abound everywhere you look. 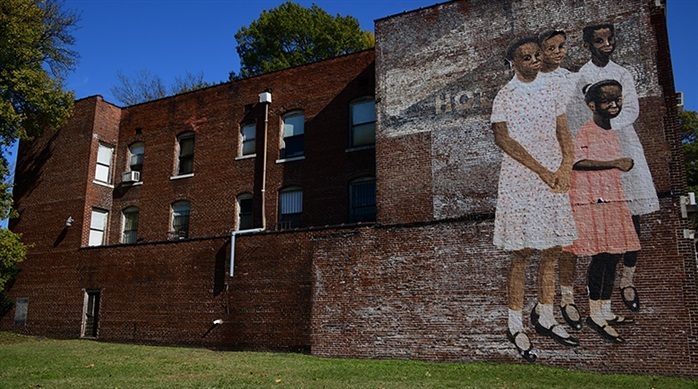 Some give you a hint about the progress made.These are a few recorded in Memphis, Tennessee, this beloved, funky river city. 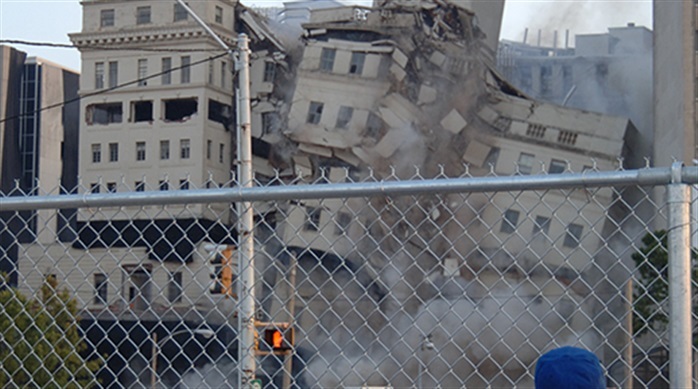 Few get to see a real implosion so when Baptist Hospital's medical building on Union Avenue was razed it brought the crowds out. 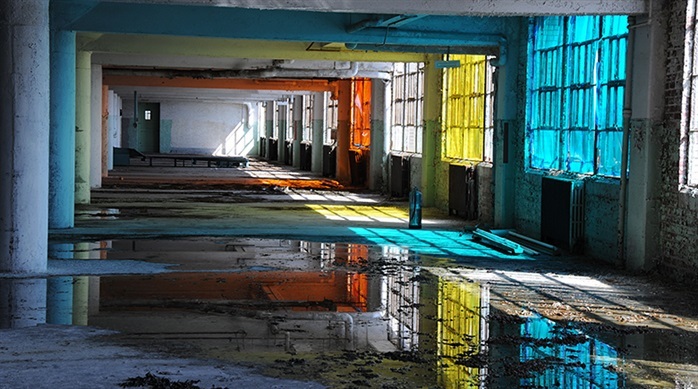 Who could have imagined that the old Sears distribution center which sat empty for over 20 years and was over 1 ½ million square feet could ever be re-purposed. This is a window into the derelict building. Today The Crosstown Concourse houses multiple businesses, restaurants, apartments, a school and artists. Daily over 3000 people make use of the now splendid facility. And what does the name Memphis bring to mind apart from music? BARBECUE! 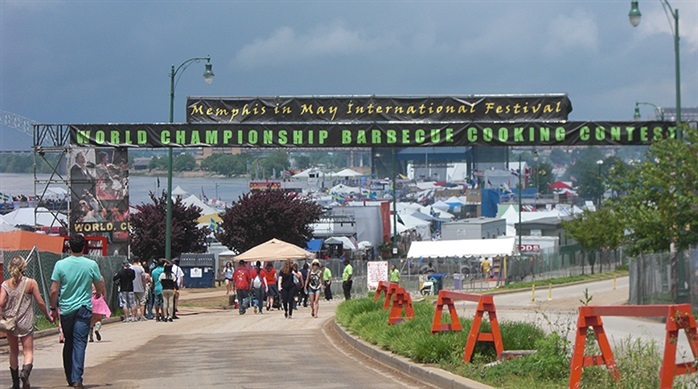 The Memphis in May World Championship Barbecue Cooking Contest draws thousands to the riverside with a number of teams coming from Europe. Dr. Martin Luther King gave his last speech and his last breath in Memphis. 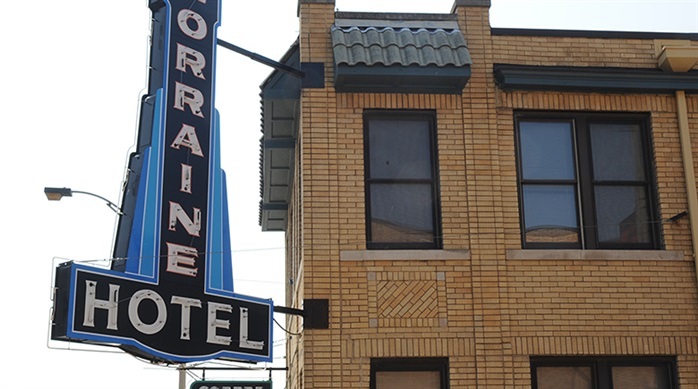 The Lorraine Hotel where the tragedy struck has redeemed that stain with the National Civil Rights Museum within its walls. 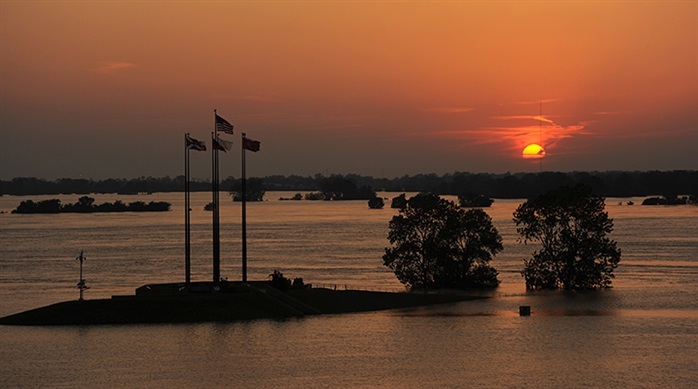 The mighty Mississippi which birthed this city seldom overflows its banks to reclaim it but when it does thousands turn out to see its power as it spreads for over a mile wide in front of Downtown. art to the people. This is a scene from Carroll Cloar's "The Wedding". 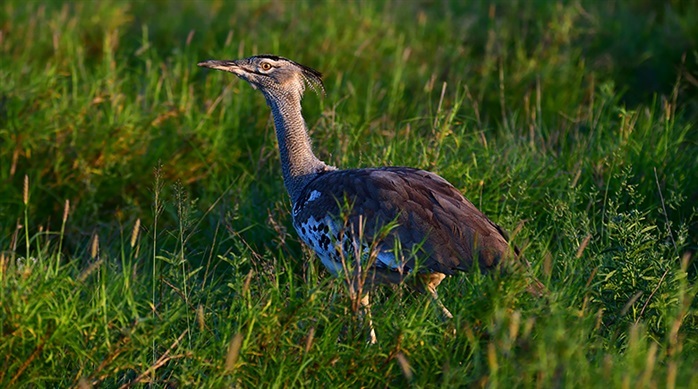 The Kori Bustard is the largest bird native to Africa that can fly. They generally weigh between 12-42 pounds and are found in Southern Africa as well as Eastern Africa. They seldom fly and forage on the ground for food as diverse as seeds, insects and small reptiles. 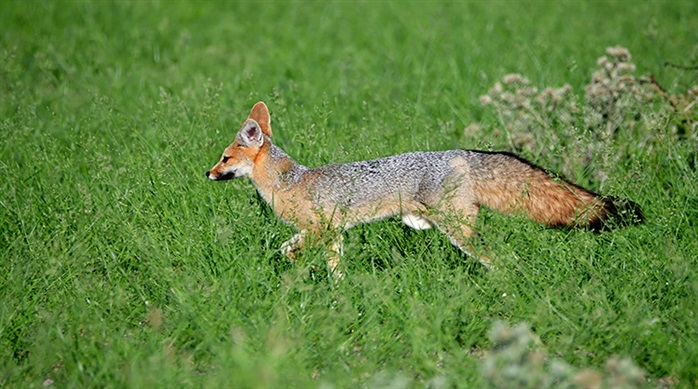 The only true fox found in Southern Africa is the Cape fox, also called the silver fox. Typically they are solitary hunters at night so we were fortunate to have a rare sighting in the Kalahari in the day time. 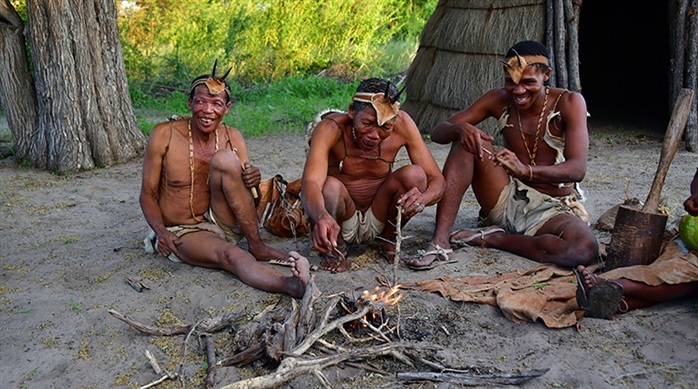 One of the most fascinating experiences we had was time spent with the San people: the Bushmen of the Kalahari. They have survived at least 20,000 years in that arid part of Botswana and Namibia. They started this camp fire by spinning fire sticks to get sparks to ignite dry vegetation. 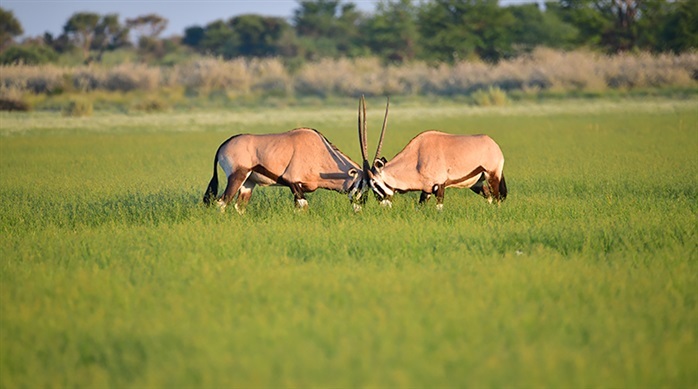 A South African oryx is also called a gemsbok. It’s a very large antelope that weighs around 400 pounds and is designed for desert life. Despite the long, sharp horns they carry they depend primarily on their speed to escape from predators. 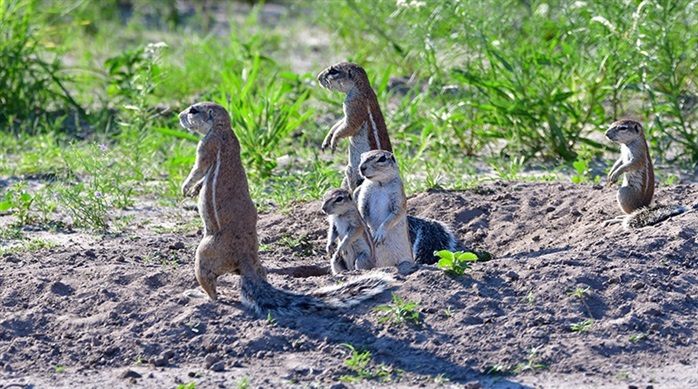 This family of Cape ground squirrels typically forages most of the day. They get the moisture they need from their food instead of drinking water. Their bushy tails serve as umbrellas to protect them from the desert sun. The underground burrows protect them from extreme weather as well as from predators. 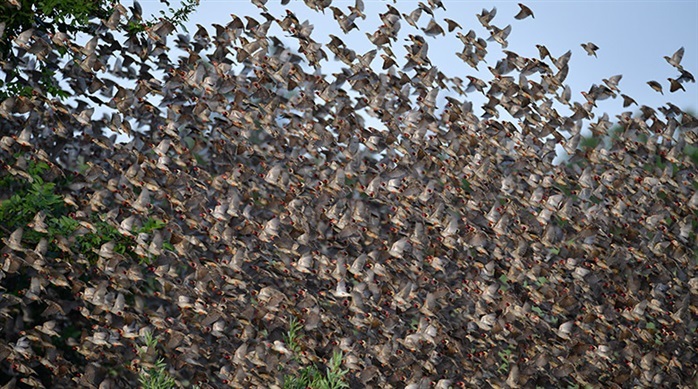 Murmuration is an astonishing phenomenon where thousands of birds fly in synch together as of one mind. Redbilled queleas are a type of weavers and sometimes fly in such concentrated numbers it would appear they would knock one another out of the sky in the Okavango Delta. 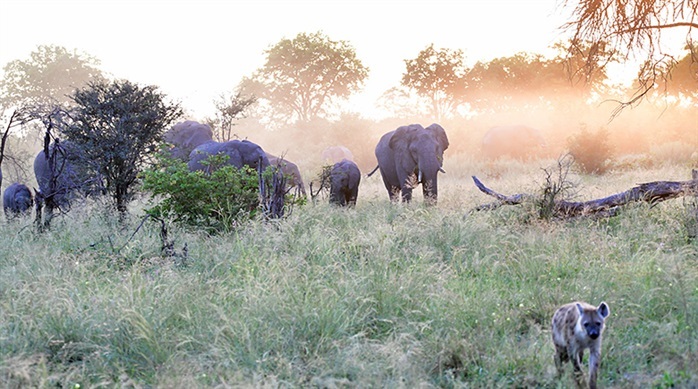 On a morning game drive we heard the literal scream of an elephant, followed by more screams and trumpeting. A dust storm appeared over the nearby trees. Our driver gunned the jeep. We were afraid something had attacked a baby elephant. As we got nearer the screen of dust we saw a hyena slinking away from its aborted attempt and being followed by enraged adult elephants. 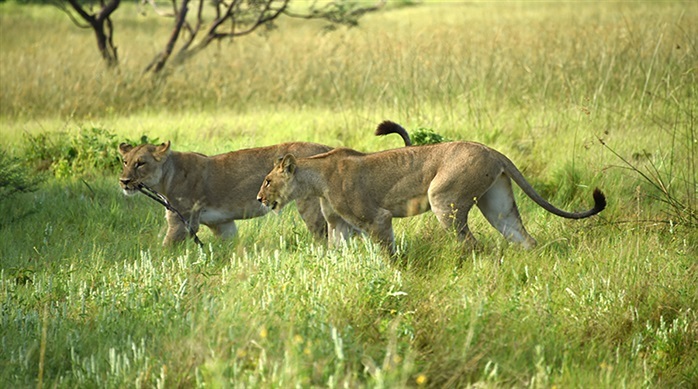 Later we ran across a lioness and her two nearly grown daughters. One had grabbed up a stick and carried it around much as a house cat would with a toy. 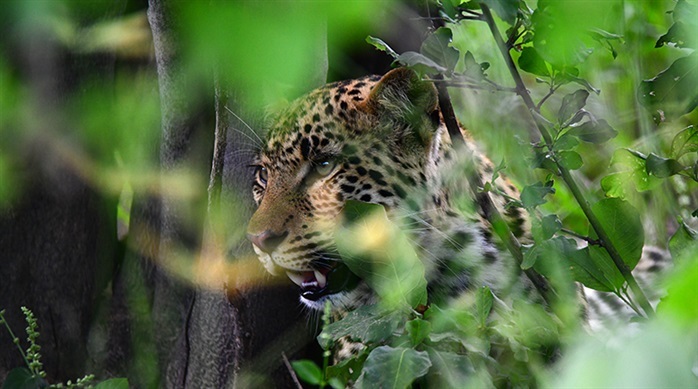 Our guide tracked an elusive leopard after hearing the warning call of a kudu. We couldn't believe as we flew through so much brush in the jeep that he finally located the youngster easily camouflaged by the undergrowth. 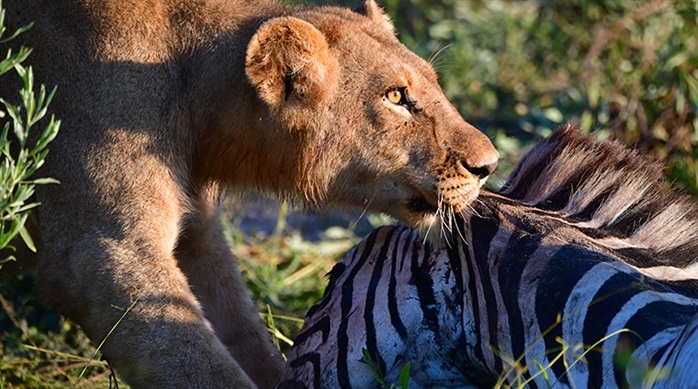 A pride of 9 lions near our second camp in the Delta took down a zebra during the night. We were able to observe them early in the morning as they gorged themselves on the fresh kill. Botswana is in Southern Africa, immediately north of South Africa and flanked by Namibia to the West and Zimbabwe to the East. Its northern borders are shared by Zambia and Angola. 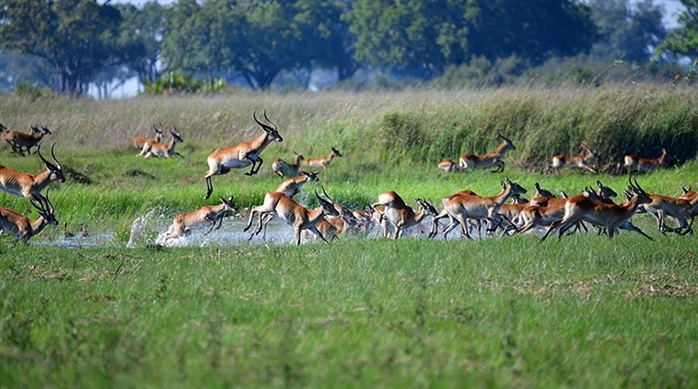 The northwest section of Botswana is the Okavango Delta which consists of 4000 square miles. 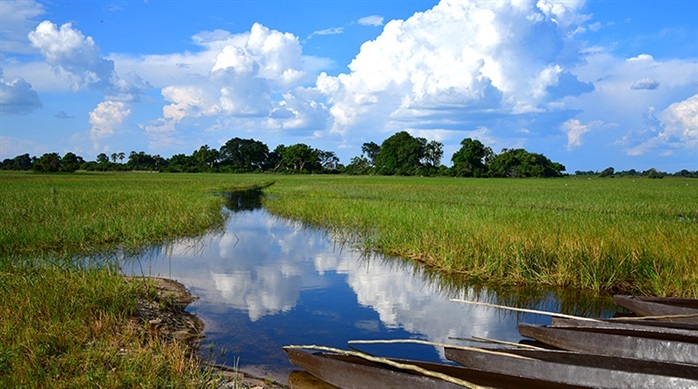 The Okavango River flows from Angola into the Delta. Mokoros are the wooden boats that are poled through lagoons and canals. 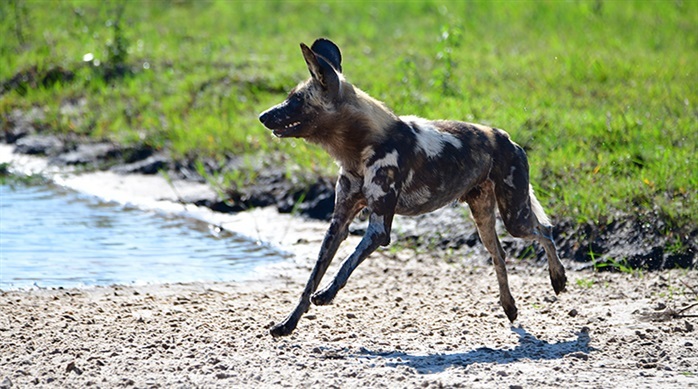 One of the most successful predators in the Delta is the African Wild Dog, also one of the most endangered carnivore. It's estimated that there may only be about 2000 left in the wild. To watch a pack chase and herd their frantic prey is a rare experience. Silently they begin to focus on one animal such as the red lechwe and together take the animal down and quickly dispatch and eat it. 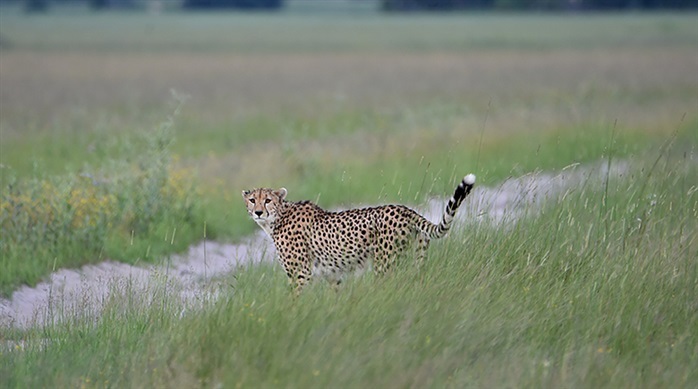 Botswana's cheetah population, approximately 2000, is estimated to be about 20% of the world's remaining wild cheetahs. These graceful beautiful cats need large territories to roam and successfully hunt. 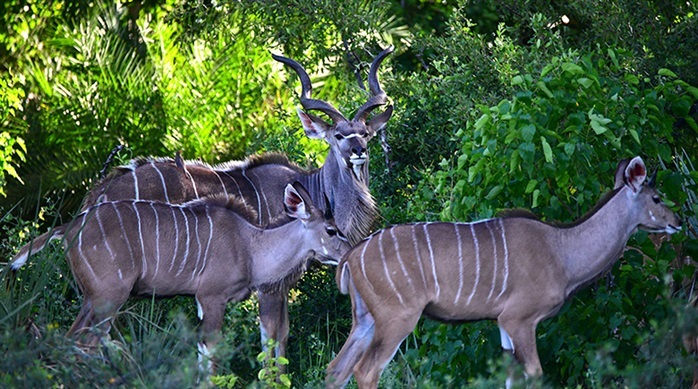 The Greater Kudu is a majestic animal. A bull can weigh between 400- 600 pounds and stand up to 63 inches tall at the shoulder. They are 6-8 feet long from head to rump. 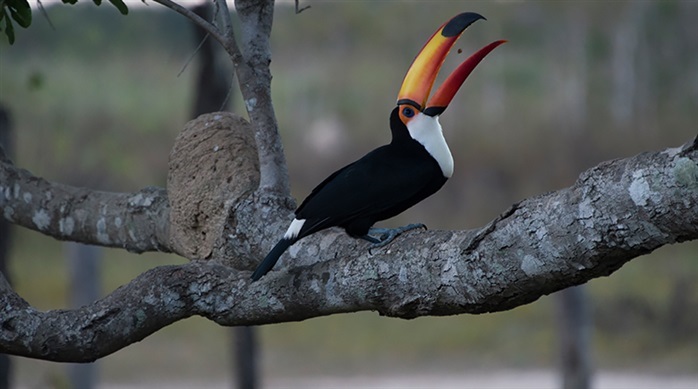 Incredibly, Brazil has approximately 1800 bird species that can be seen within the country. 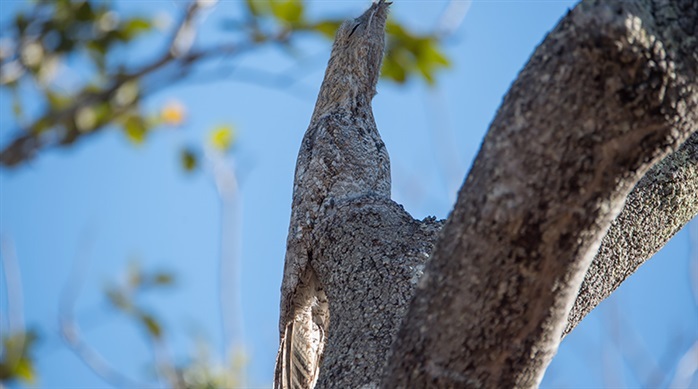 One of the most peculiar is the Great Potoo which really looks like a piece of wood. It's a nocturnal bird but is often found by sharp-eyed guides in the daytime. 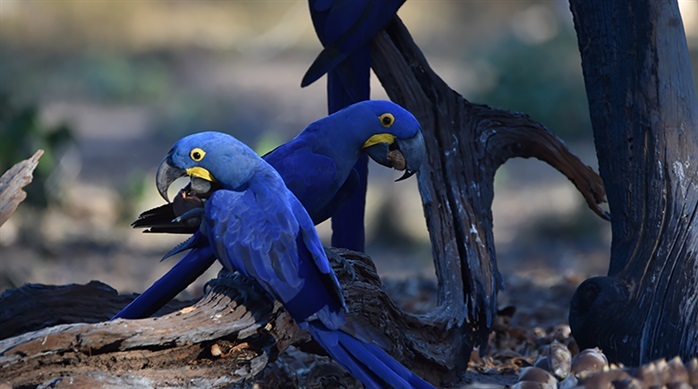 Hyacinth macaws have spectacular blue feathers. They are the largest of the macaw or parrot family, from 3'-3 1/3' in length from the top of the head to the tip of the tail. They look like something made up by Disney. It is an endangered species and there are estimated to be between only 2500-5000 in the wild today. 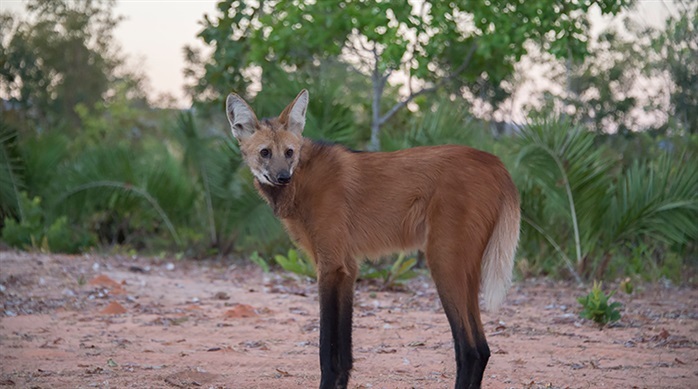 A maned wolf isn't really a wolf, but is the largest canid in South America. Some call it a fox on stilts because of its long legs and reddish coloring. The "mane" is the black hair on its neck and shoulders. 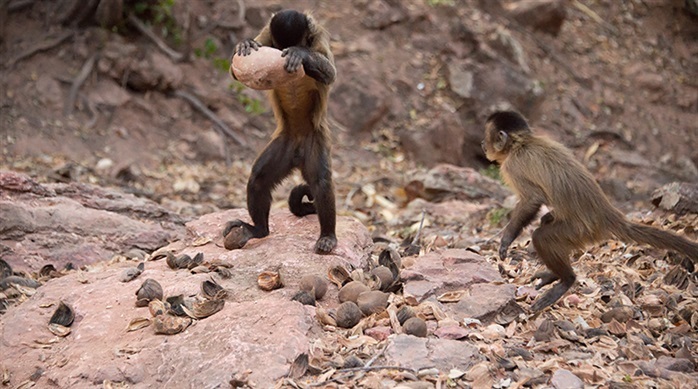 It is fascinating to watch capuchin monkeys use specific types of stones as tools for breaking open palm nuts. They are very deliberate in placing the nut on a flat rock & slam the large rock down to break it. When the alpha male decides to move in to that flat rock the subservient monkey scampers away and goes to a different location to start over. 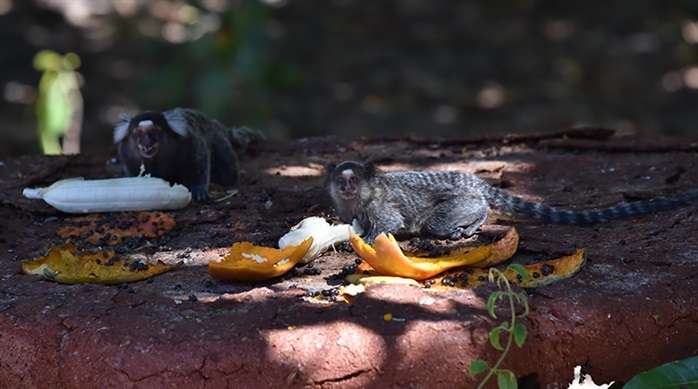 The common marmoset is a monkey with a very long tail. It eats insects and fruit and lives in the scrub forest of northeastern Brazil. It has distinctive white tufts of hair on its ears. This is an adult and a young one feeding together. One of the surprising facts I learned this month is that Brazil is about the size of our lower 48 states. Its 207 million people live primarily in the coastal lowland areas. The Pantanal is a huge wetlands in the state of Mato Grosso do Sul. It is the largest fresh water wetlands in the world and is the home to hundreds of bird species and many exotic animals. The toco toucan is one of its most colorful inhabitants. 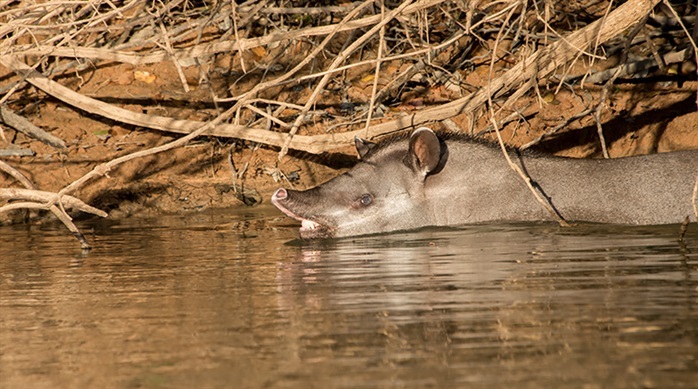 The tapir is a rare sight indeed as it swims in a river early morning. Their snout is somewhat like an elephant's trunk but it is the upper lip and nose of the animal. Giant otters can be between 5'-6' in length. 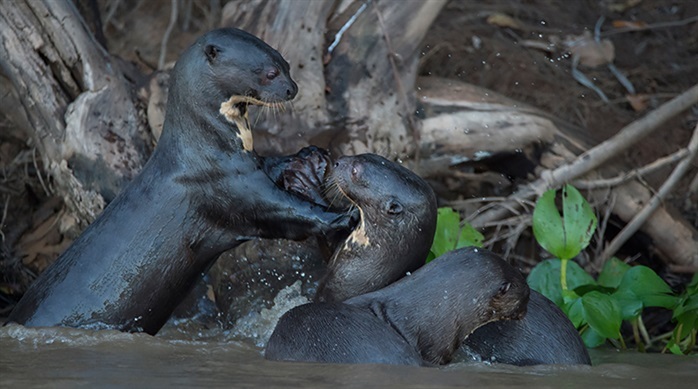 They are as playful as the smaller river otters seen in the U.S. Fish are their main diet. 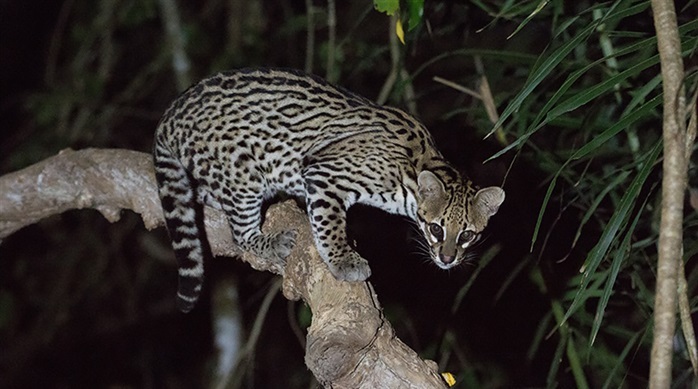 Ocelots are creatures of the night and thus are seldom seen. They are close in size to the bobcat but are leaner and longer. 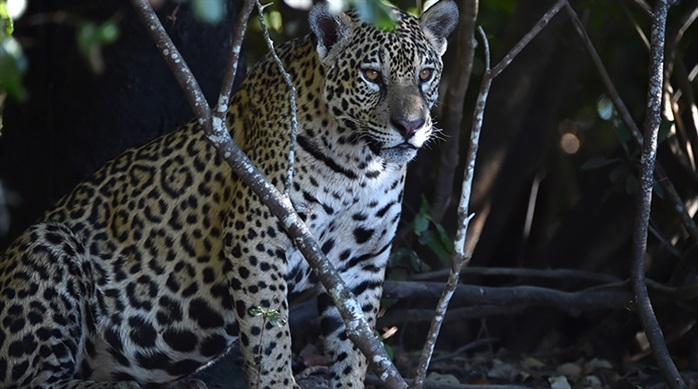 The queen of the Brazilian Pantanal is the jaguar. Similar to but more muscular and larger than a leopard, these beautiful cats hunt along the river banks for capybara and caiman to pounce on. 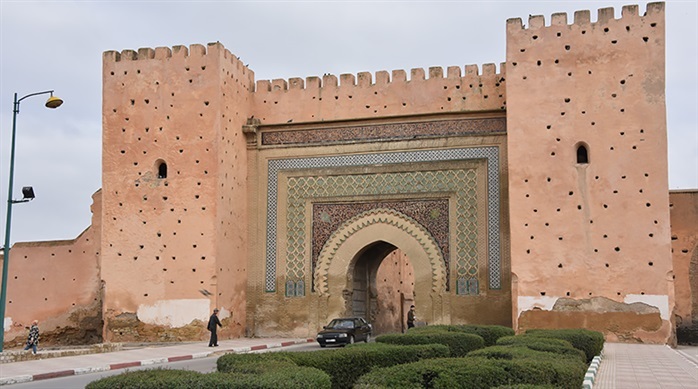 The medina (walled city) of Fez, Morocco has two sections: the old part is 9th century and the "new" one is 14th century . 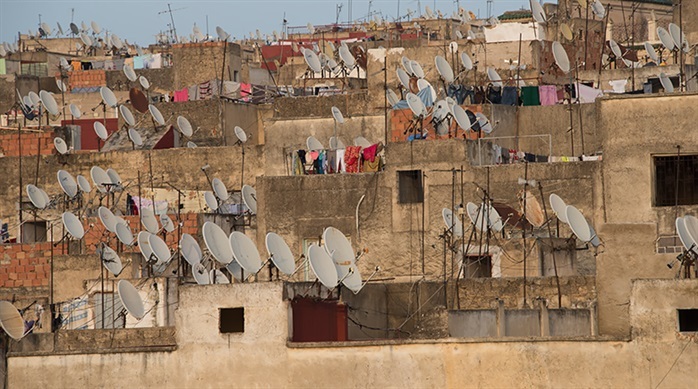 No better contrast is seen of truly old and truly new than the array of satellite dishes perched on 9th century dwellings. All through the medinas in Moroccan cities are the various souks, or markets, where the inhabitants shop daily for fresh produce, meat, fish, tools, clothing and anything else needed by the family. 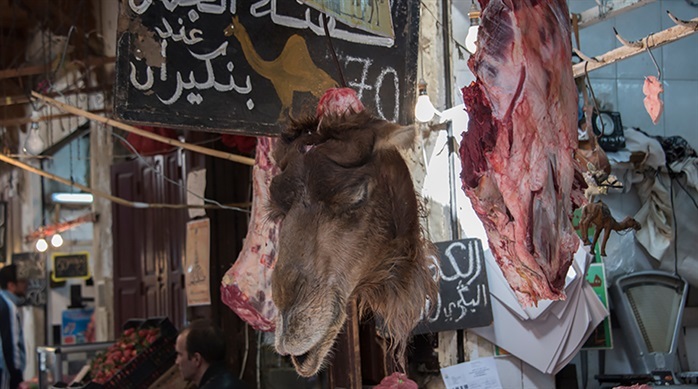 In Fez there was one souk obviously selling camel meat. The medinas across the country often have lovely entry portals. Menkes is particularly famous for the gates at its entry points. 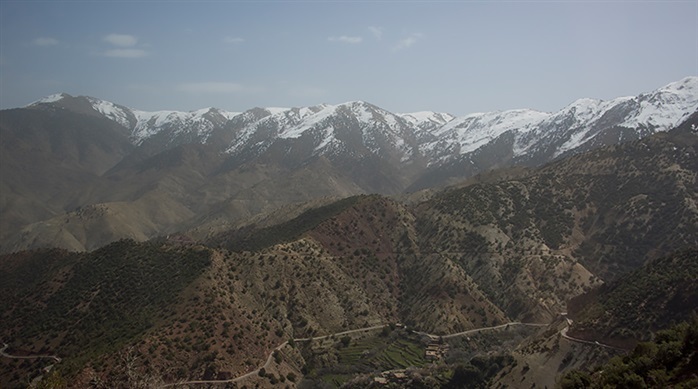 There are three sections of the Atlas Mountains across Morocco. The High Atlas is crossed traveling from Marrakesh to Taroudant. At a distance you can see the old caravan trail hugging the mountain walls. Moroccan oil has become a well recognized ingredient in hair and cosmetic products. It is made from the nut of the argan tree in a small section of Morocco. Typically, women process the oil which involves a number of steps to get to the kernel at the heart of the nut. 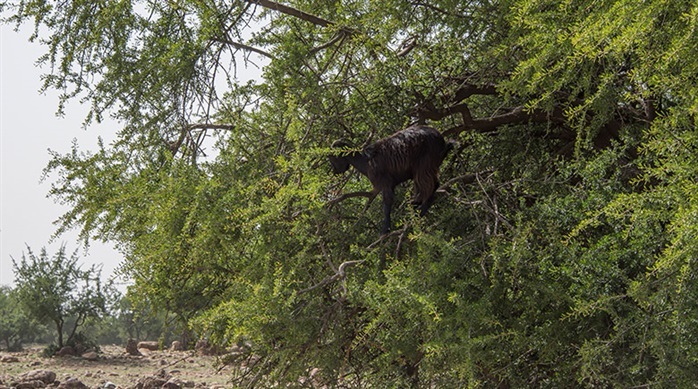 Alternatively, goats actually climb the trees, eat the nuts, expel the kernels at a later time. That is extracted, cleaned and processed into oil. Efficient goats. 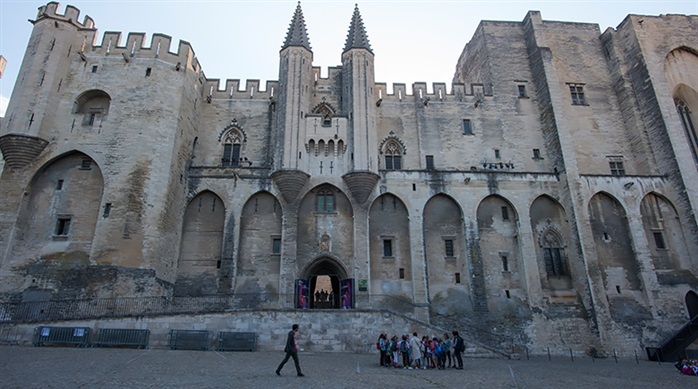 In 1309 Pope Clement V, a Frenchman, moved the papal court to Avignon where it stayed for 68 years. The Papal Palace was as much a fortress as a palace. Even after Pope Gregory XI moved the official papacy back to Rome there was a Western Schism which divided the Catholic world. From 1378-1417 a rival succession of popes, referred to as the antipopes, ruled from Avignon until an agreement was made to only have one pope, in Rome. 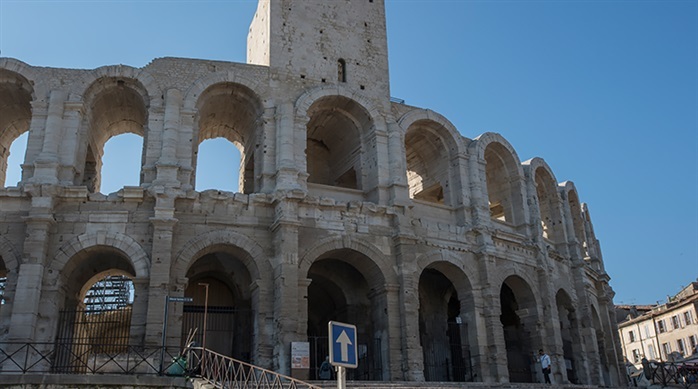 One of the best preserved Roman buildings in France is the coliseum in Arles. Built around the first century, the UNESCO World Heritage Site could accommodate 20,000 spectators. Miraculously, it is still in use today, for bull fights. 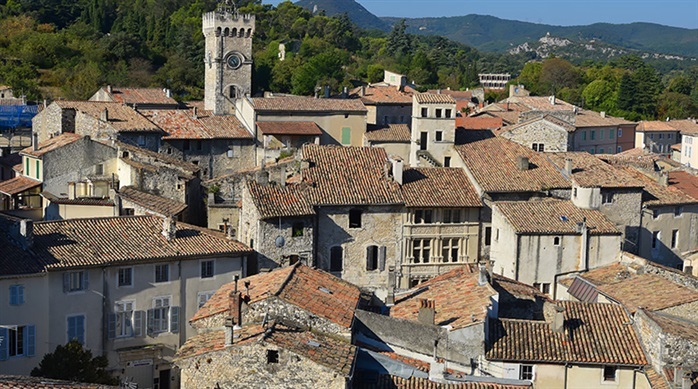 Viviers is a small walled town overlooking the Rhone and contains the smallest cathedral in France. From 430 AD forward for hundreds of years it played an important part in Catholic life. Many of the bishops who lived and worked there were elected into sainthood. 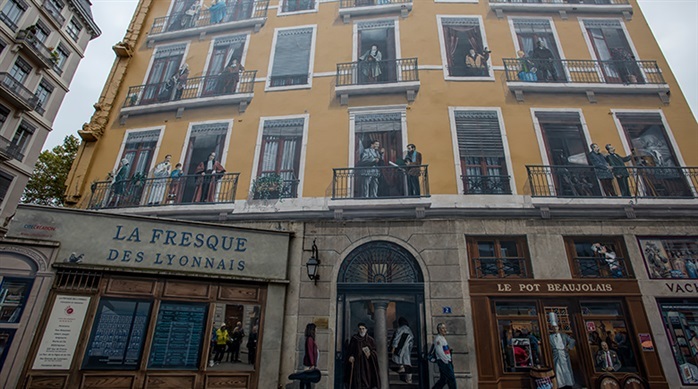 Lyon has over 100 murals painted on the walls of city buildings. Many artists have come together to create these astonishingly realistic slices of urban life. The Doux Valley, near Tournon, has stunning views into a deep gorge cut out by the Doux River. 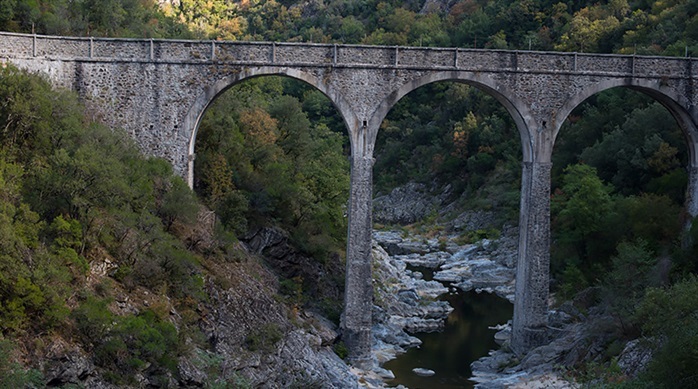 A number of arched bridges dot the landscape.